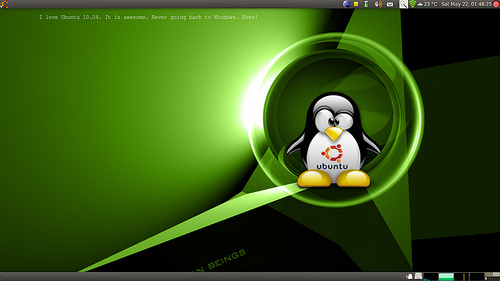 The power of Ubuntu – showing dynamic messages in your desktop background! I worked on this cool hack to dynamically show Twitter messages embedded into the desktop background. The basic idea is to have some dynamic text (which could be fetched from the web) embedded in an SVG image, which is set as the desktop background. The SVG image contains the actual wallpaper that we intend to use. Run the script once, it will create a file called wall.svg in your Wallpapers directory. Set this as your desktop background and watch the background change every minute! You could get very creative with this. You could have your calendar reminders embedded directly into your desktop background or you could have dynamically fetched background images with your own random fortune quote. The possibilities are enormous! Posted on May 22, 2010 November 8, 2016 Categories TechnologyTags dynamic-wallpapers, gnome-hack, hack, twitter, ubuntu, ubuntu-hack2 Comments on The power of Ubuntu – showing dynamic messages in your desktop background! “The Afterthoughts” is a series where I revisit some of my older blog entries and see how things have changed since the time I made the blog post and now. 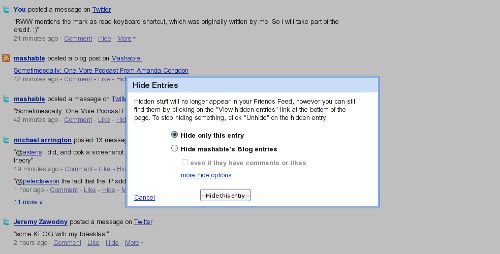 The posts that I will choose initially will be from 2004 to 2006. The entry goes about explaining how when you connect various services together, you could end up with the same information multiple times. This is increasingly becoming a problem these days. Services like Twitter and Friendfeed are not solving the problem elegantly, so you see more and more duplicates and links to the original post. I make a blog entry. In order to ensure that my readers see my post immediately, I have a service that automatically posts a message in Twitter. This is like instantly messaging my friends (actually Twitter followers) telling them, “Look, I made a blog entry”. Now, I use a lot of Web 2.0 services. So, in order to ensure that all my friends have a single feed to follow my activities, I use some aggregator like FriendFeed or Tumblr. Some friend of yours (let&apos;s call him Bob) likes your blog entry and bookmarks it on del.icio.us. Another friend, Andrews bookmarks it in Magnolia. Let us now say, there is another person Dave, who is a friend of you, Bob and Andrews. He is following all 3 of us in Friendfeed. How many entries is Dave going to see of the original entry? 6 in total! 3 from you – 1 from your blog post directly, 1 from Twitter, 2 from Tumblr (1 via the blog post and 1 via Twitter), 1 from Bob via del.icio.us and 1 from Andrews via Magnolia. Now this is real noise. And this is more true if Dave is not even interested in the blog post to begin with. 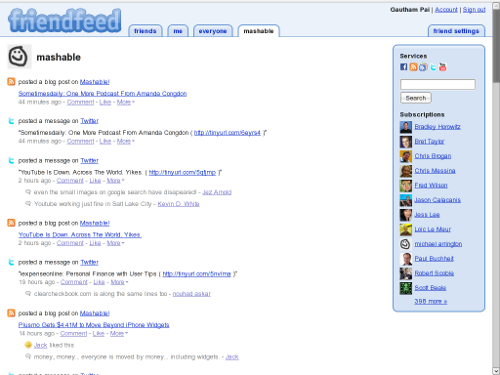 Friendfeed allows you to hide specific feeds from specific people. For example, Dave can hide all bookmarks from Bob or all Tumblr entries from me. Now that is not a good solution because not all bookmarks from Bob are duplicates. Tools like Feedblendr and Blogbridge have solved this problem for simple RSS aggregation. However things are different when it comes to social network and aggregation. So right now there is no simple way of detecting duplicates and more and more people are complaining about this in the blogosphere explaining how Friendfeed is more noise than information and why the good old Google Reader is still relevant. Here is one such discussion. As the discussion suggests, it is not just about eliminating duplicates; it also requires you to merge discussions/comments in each of these posts keeping in mind that not everyone is a friend of everyone else. So what has changed over the last 2 years? If anything, the problem has become a tougher one. I am sure the startup that does duplicate elimination and gives you a filtered feed taking your social networks into consideration is going to be the next hyped startup in the Web 2.0 world. Imagine you have a host of aggregation services like Friendfeed, Tumblr, Suprglu, Lifestreams connected to each other, such that each one is reading from your various feeds and republishing the content. Now imagine a disaster where one of these services, say Twitter, suddenly, because of some flaw, exposes your private messages. It&apos;s like a Tsunami that cannot be controlled! Your private data would flow into various input streams in a matter of seconds and there is no turning back. Things will only get worse with activity feeds and Beacon. The bottom line is: Be careful about where your data is going and what data you put online. Whenever I use some service over the web, I look for several things. Ease of use and customisability are important factors. However, the most important thing I consider is vendor lock-in (or rather the lack of it). Let&apos;s say I am using a particular mail service (ex, GMail). If someday, I find a better email service, would it be easy for me to switch to that service? How easy is it for me to transfer my data from my old service to my new service? For services like Mail, there are standard protocols for data access. So this is not an issue. However for the more recent services, like blogging, micro-blogging etc, the most widely used data access methodology/format is &apos;HTTP&apos; via &apos;RSS&apos; or &apos;ATOM&apos;. However, it&apos;s not the case that all services provide data as RSS (or XML or in any other parseable form). For example, suppose I make a list of movies I have watched, in some Facebook application, or a list of restaurants I visited, how do I download this list? If I cannot download it, does it mean I am tied to this application provider forever? What if I have added 200 movies in my original service and I come across another service that has better interface and more features and I want to switch to this new service but not lose the data that I have invested time to enter in my original service? In fact, recently when I tried to download all my Twitters, I realized that this feature has been disabled. You are not able to get your old Twitters in XML format. So what do we do when a service does not provide data as XML and we need to somehow scrape that data and store it? This is kind of related to my last blog entry. So I started thinking of ways in which I could download my Twitters. The solution I thought of initially was using Rhino and John Resig&apos;s project (mentioned in my previous blog entry). However, I ran into parse issues like before. So I had to think of alternative ways. Now I took advantage of the fact that Twitters are short (and not more than 140 characters). If you intend to use this, do remember to change the URL to post data to. The GM script scrapes the twitters from a page and posts it to the server using <script> includes. The server stores the twitters in some data store. The server also checks if the twitter posted was the last twitter in the page. If so, it sends back code to change to the next page. Thus the script when installed, will post twitters from the most recent to the oldest. Ok, now how would this work with other services? * Get the data elements from the present page – data elements could be movie details, restaurant details etc. * Post data elements to the server. ** The posting might require splitting the content if the length is more than the maximum length of the GET request URL. * Identify how you can move to the next page and when to move to the next page. Use this to hint the server to change to the next page. * Write the server side logic to store data elements. * Use the hint from the client to change to the next page when required. The biggest advantage of this method is we make use of the browser to do authentication with the remote service and also to do the parsing of the HTML (which, as I mentioned in my previous post, browsers are best at). I have been looking for the perfect micro-blogging service. In the last one week I tried 3 services: Twitter, Tumblr and Pownce. Simple and elegant. Gets the job done. The 140 character limit is more limiting than SMS. No option to comment on twitters. The @ replies are confusing. Really cool interface. Ability to post text, photos, links, audio and video in one place. Import entries from other services like del.icio.us, flickr, twitter etc. Easy sharing of all my entries with people in my social-network. Ability to comment on entries. Entries can be either for self or public. The timestamp on imported entries is wrong (possibly because of timezone differences). Some of the entries are not imported – looks like a bug. Extensive privacy options for entries. Looks like there is Facebook integration (not tried this yet). There is no ability to import entries from other services. All 3 services have API support. I am still on the look out for a good microbloging service. I need some service that offers the simplicity of Twitter and the features of Tumblr. I will stick to Twitter until I see one service that helps me with all my requirements. I have started twittering at Twitter.com. Stay tuned in both places or use SuprGlu to get one place view of all my web-activity.